At 3.25 pounds with the super-sized tablet—nearly as much as a 13-inch MacBook Pro!—I assumed there was nowhere to go but down in terms of weight and girth for future keyboard cases. As it turns out, I was wrong. If you don’t mind MacBook-style weight and girth in an iPad Pro case, Razer’s keyboard and detachable design are a winning combination. Weighing 3.75 pounds with tablet (2.25 pounds alone), the Razer Mechanical Keyboard Case ($70 on Amazon) is the new heavyweight champion of iPad Pro cases, but it does offer a few compelling advantages over the competition. As the name implies, Razer’s case utilizes ultra-low-profile mechanical switches for its chiclet-style keys, delivering the same performance and feel as a dedicated full-sized keyboard. It’s downright luxurious. Of course, mechanical switches tend to make more noise when typing. That’s never bothered me. I prefer to hear the satisfying click-click-click as I write, but neighbors in the next cubicle or adjacent Starbuck’s table might not appreciate the increased decibels. The backlit keys offer a whopping 20 levels of illumination compared to only two with Logitech’s case, so you’re sure to find a setting comfortable enough for any low-light situation. With the keys at maximum brightness, the case stays powered for about 10 hours on a single charge, but is capable of nearly 600 hours with backlighting turned off. Chiclet-style mechanical switch keys are a highlight of the new Razer Mechanical Keyboard Case for iPad Pro. At just over a foot wide and nearly nine inches deep, typing is quite comfortable, although the keys are slightly small (especially Command) and less ergonomic, recessed into an otherwise flat base. While Logitech appealed to MacBook users with Create, Razer has gone its own way, shifting the arrow keys to fit a rectangular form factor and printing tiny modifiers below each key’s function, rather the more universally-accepted method. Razer is a company with a reputation for jet-black hardware, and the Mechanical Keyboard Case is no exception. The polycarbonate case has a great look and feel with all-over protection, but I wouldn’t recommend using it for typing on your lap. It’s quite easy to pop the tablet in and out as needed, a procedure I found overly difficult with the Logitech case. Unlike Create, Razer’s case does not include a Smart Connector, instead pairing over Bluetooth. I was initially disappointed after being spoiled by the convenience of having one less accessory to charge, but there’s a good reason for it: The bottom of the case features a magnetic hinge so the tablet can be detached from the base. For those with a larger desk or tabletop, the iPad Pro can be placed further away from the keyboard. 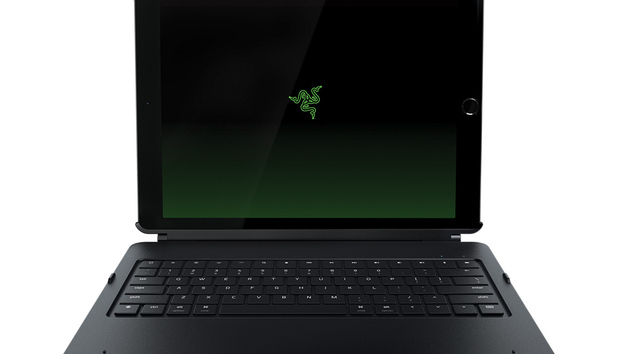 The Razer Mechanical Keyboard Case features a unique metal kickstand that allows an iPad Pro to be displayed at almost any viewing angle. This is made possible by a rigid metal kickstand that adjusts to almost any viewing angle. When detached, the kickstand folds flat against the back of the case, slimming the overall weight to under 2.5 pounds for a more comfortable experience when the keyboard isn’t required, such as reading or web browsing. I used the Razer keyboard to write this entire review on my iPad Pro, and aside from the usual iOS limitations with text selection and editing, typing skill and accuracy was on par with what I’m accustomed to on the desktop. It’s worth noting Razer’s case is strictly for the original 12.9-inch iPad Pro, although presumably a 9.7-inch model will follow. Despite this promotional image, the Razer Mechanical Keyboard Case isn’t very comfortable for use on your lap. The mechanical keys and detachable design of the Razer Mechanical Keyboard Case are a winning combination, but only for iPad Pro owners willing to put up with the extra bulk.